We only understand a sliver of how the brain works, but we do know that it often learns through trial and error. We’re rewarded when we do good things and punished when we do the wrong ones; that’s how we figure out how to live. Reinforcement Learning puts computational power behind that exact process and lets us model it with software. These literally are the exact building blocks of Reinforcement Learning (maybe Machine Learning is just a game?). In RL, we guide an agent through an environment, state by state, by issuing a reward every time the agent does the right thing. If you’ve heard the term Markov Decision Process thrown around, it pretty much describes this exact setting. 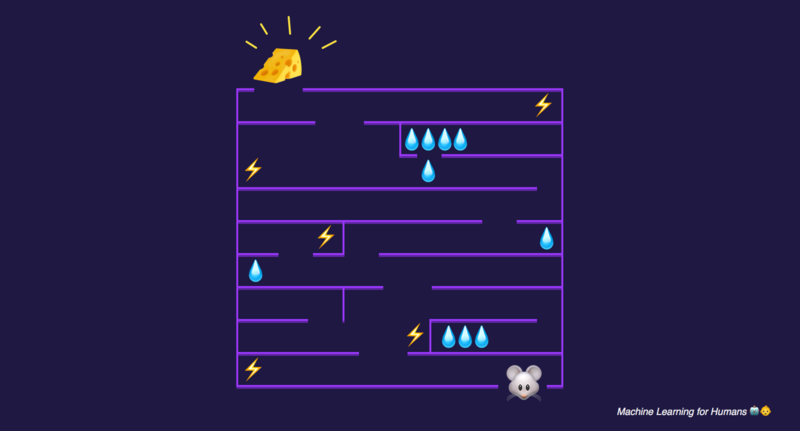 If you were navigating the maze yourself and your goal was to collect as many rewards as possible (the water droplets and cheese), what would you do? At each state (position in the maze), you’d calculate what steps you need to take to reach the rewards near you. If there are 3 rewards on your right and 1 on your left, you’d go right. 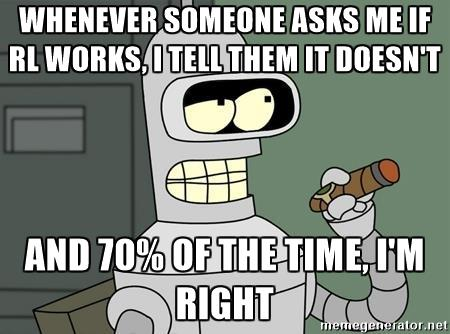 This is how Reinforcement Learning works. At each state, the agent makes an educated calculation about all of the possible actions (left, right, up, down, you name it) and takes the action that’ll yield the best result. After completing this process a few times, you’d imagine that our mouse might know the maze pretty well. But how exactly do you decide what the “best result” is? There are 2 broad approaches for how you can teach your agent to make the right decisions in a Reinforcement Learning environment. Policy learning is best understood as a set of very detailed directions – it tells the agent exactly what to do at each state. A part of a policy might look something like: “if you approach an enemy and the enemy is stronger than you, turn backwards.” If you think of a policy as a function, it only has one input: the state. But knowing in advance what your policy should be isn’t easy, and requires deep knowledge of the complex function that maps state to goal. There’s been some very interesting research in applying Deep Learning to learn policies for Reinforcement Learning scenarios. Andrej Karpathy implemented a neural net to teach an agent how to play the classic game of pong. This shouldn’t surprise us, since neural nets can be very good at approximating complicated functions. Another way of guiding our agent is not by explicitly telling her what to do at each point, but by giving her a framework to make her own decisions. Unlike policy learning, Q-Learning takes two inputs – state and action – and returns a value for each pair. If you’re at an intersection, Q-learning will tell you the expected value of each action your agent could take (left, right, etc.). One of the quirks of Q-Learning is that it doesn’t just estimate the immediate value of taking an action in a given state: it also adds in all of the potential future value that could be had if you take the specified action. For readers familiar with corporate finance, Q-Learning is sort of like a discounted cash flow analysis – it takes all potential future value into account when determining the current value of an action (or asset). In fact, Q-Learning even uses a discount-factor to model the fact that rewards in the future are worth less than rewards now. Policy Learning and Q-Learning are the two mainstays of how to guide an agent in Reinforcement Learning, but a bunch of new approaches have been using Deep Learning to combine the two or attempt other creative solutions. DeepMind published a paper about using neural nets (called Deep Q Networks) to approximate Q-Learning functions, and achieved impressive results. A few years later, they pioneered a method called A3C that combined Q-Learning and Policy Learning approaches. Adding neural nets into anything can make it sound complicated. Just remember that all of these learning approaches have a simple goal: to effectively guide your agent through the environment and acquire the most rewards. That’s it. While the concepts supporting Reinforcement Learning have been around for decades, unfortunately it’s rarely implemented in practice today in business contexts. There are a number of reasons for that (see the challenges section below), but they all follow a similar thread: Reinforcement Learning struggles to efficiently beat out other algorithms for well defined tasks. Most of the practical application of Reinforcement Learning in the past decade has been in the realm of video games. Cutting edge Reinforcement Learning algorithms have achieved impressive results in classic and modern games, often beating out their human counterparts by a significant margin. This graph is from the above mentioned DQN paper by DeepMind. 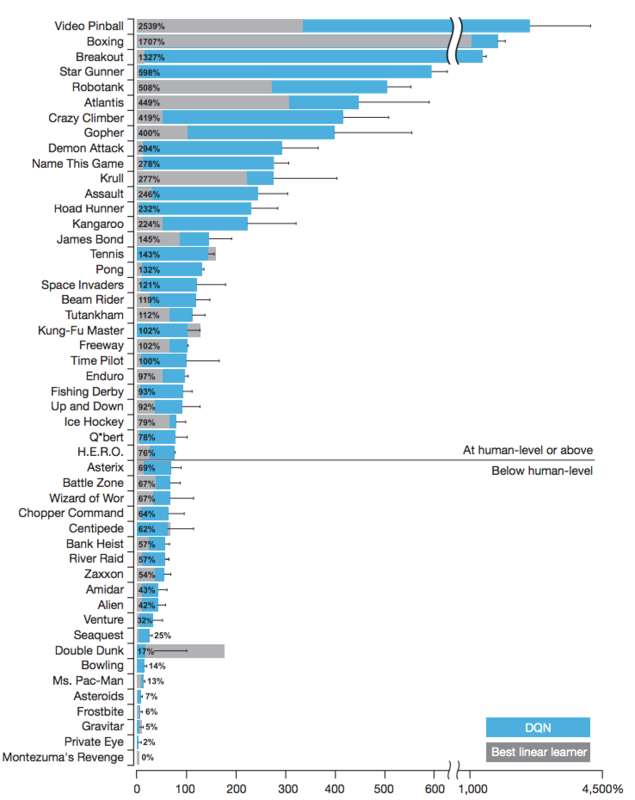 For more than half the games tested, their agent was able to outperform human benchmarks, often by more than double the skill level. For certain games though, their algorithms weren’t even close to human performance. The other major area where RL has seen some practical success is in robotics and industrial automation. Robots can easily be understood as agents in an environment, and Reinforcement Learning has been shown to be a feasible teaching solution. Google has also made progress using Reinforcement Learning to cut down costs in their data centers. Healthcare and education are also promising areas for Reinforcement Learning, but most of the work is purely academic at this point. While extremely promising, Reinforcement Learning is notoriously difficult to implement in practice. 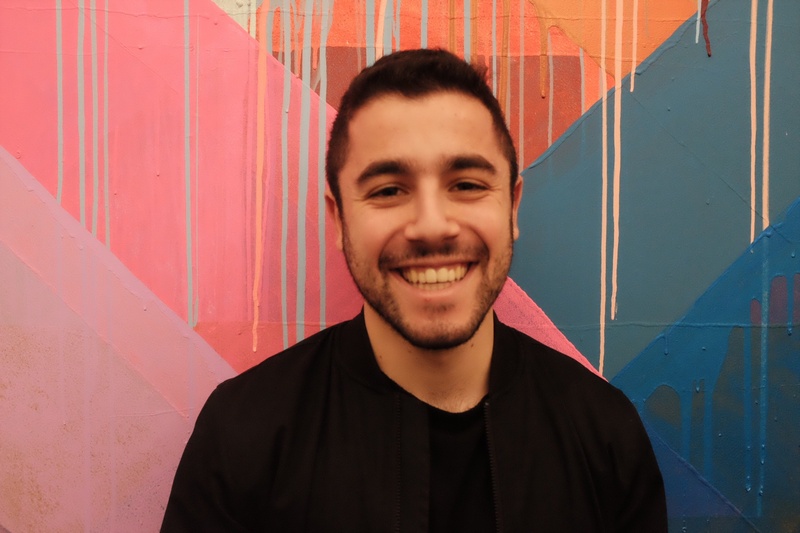 The first issue is data: Reinforcement Learning typically requires a ton of training data to reach accuracy levels that other algorithms can get to more efficiently. RainbowDQN (from the most recent DeepMind paper) requires 18 Million frames of Atari gameplay to train properly, or about 83 hours of play time. A human can pick up the game much faster than that. This issue seems to hold across disciplines (like learning a running gait). Another challenge in implementing Reinforcement Learning is the domain-specificity problem. Reinforcement Learning is a general algorithm, in that it should theoretically work for all different types of problems. But most of those problems have a domain-specific solution that will work better than RL, like online trajectory optimization for MuJuCo robots. There’s always a tradeoff between scope and intensity. Finally, the most pressing issue with Reinforcement Learning as it currently stands is the design of the reward function (recall Q-Learning and Policy Learning). If the algorithm designers are the ones setting up rewards, then model results are extremely subjective to the bias of the designers. Even when set up properly, Reinforcement Learning has this clever way of finding ways around what you want it to do and getting stuck in local optima. With so much cutting edge research focused on advancing Reinforcement Learning, expect some of these kinks to get ironed out over time.